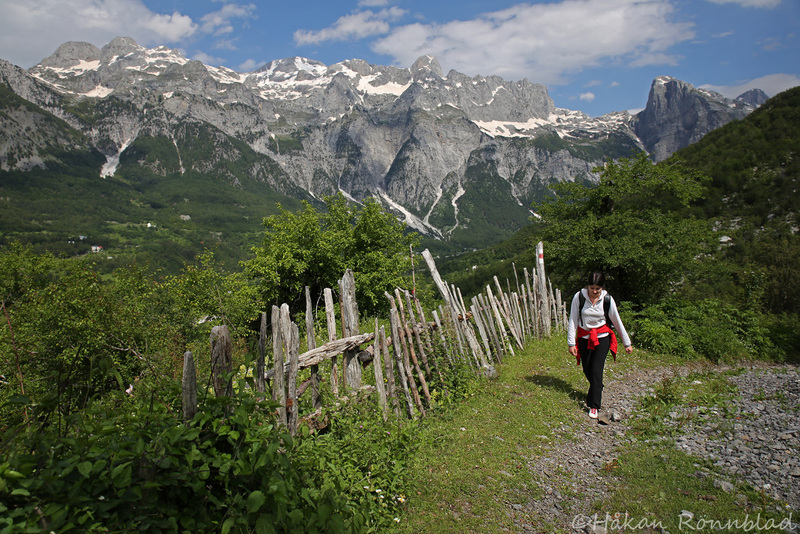 Looking at the picture it might seem like a walk in the park.. and actually it was in the beginning, this is Thethi National Park in northern Albania, after a couple of hours though, the snowy precipices at altitudes close to 2000m, started to challenge us!!! It´s a tough trail and neither me or Erisa, my Albanian friend have got a lot of experience in mountaineering.. Furthermore the night before our adventure we received a warning sign that almost made us change our minds! Three Polish alpinists arrived from the same path exhausted, injured and with pale faces. They told us about the very difficult conditions up there…. What made us finally decide to climb anyway was the confident face of Marash, our local guide who had made the route many times. I´ll post the rest of the photos from this mountain crossing tomorrow. Picture above taken June 11. This entry was posted in Albania, photography and tagged Albanian alps, alpinism, climbing, eagles, Erisa Cakalli, high altitude, local guide, Marash, mountaineering, Northern Albania, Theth valley, Thethi National Park, Thethi valley, Valbona valley, walk in the park, warning sign. Bookmark the permalink. I agree completely Helge.. thank you for commenting.